New York : Pantheon Books, 2011. From the invention of scripts and alphabets to the long misunderstood "talking drums" of Africa, James Gleick tells the story of information technologies that changed the very nature of human consciousness. He also provides portraits of the key figures contributing to the inexorable development of our modern understanding of information, including Charles Babbage, Ada Byron, Samuel Morse, Alan Turing, and Claude Shannon. Shannon's take on language is disconcerting. From the outset, he was determined to divorce information from meaning. That's why a random string of letters is more information-rich, in Shannon's sense, than a coherent sentence. There is a definite value in his measure, not just in computing but in linguistics. Yet to broach information in the colloquial sense, somewhere meaning must be admitted back into all the statistics and correlations... Gleick too readily accepts the standard trope that genes contain the information needed to build an organism. That information is highly incomplete. Genes don't need to supply it all, because they act in a molecular milieu that fills in the gaps. It's not that the music, or the gene, needs the right context to deliver its message – without that context, there is no message, no music, no gene. An information theory that considers just the signal and neglects the receiver is limited. It is the only serious complaint about a deeply impressive and rather beautiful book. A highly ambitious and generally brilliant effort to tie together centuries of disparate scientific efforts to understand information as a meaningful concept. For a society that believes itself to live in an information age, the subject could hardly be more important. That the project doesn't fully succeed has more to do with the limits of our understanding than with Gleick's efforts. This is all engagingly told, though Gleick’s focus on information systems occasionally leads him to exaggerate the effects technologies like printing and the telegraph could have all by themselves. For example, he repeats the largely discredited argument, made by the classicist Eric Havelock in the 1970s, that it was the introduction of the alphabet that led to the development of science, philosophy and “the true beginning of consciousness.” Such errors are mostly minor. But Gleick’s tendency to neglect the social context casts a deeper shadow over the book’s final chapters, where he turns from explicating information as a scientific concept to considering it as an everyday concern, switching roles from science writer to seer. Entertaining, funny and clever, The Information puts our modern "information revolution" in context, helping us appreciate the many information revolutions that preceded and enabled it. The internet certainly has changed things, but Gleick shows that it has changed only what has already changed many times before. Bestselling science and technology writer Gleick (Genius) gives a brilliant, panoramic view of how we save and communicate knowledge-from ancient African drumming to alphabets, the telegraph, radio, telephone and computers-and provides thrilling portraits of the geniuses behind the inventions. This sprawling volume explores of the idea of information: how we encode and transmit it, how we think about it, and what we do with it. Gleick starts out talking about African drum signals, the invention of writing, and the advent of the telegraph, then moves on through Charles Babbage and his early anticipation of the computer age and into discussions of mathematics, computer science, cryptography, biology, and physics, exploring the ways in which the concept of "information" has evolved in and influenced all of these various fields. Some of this stuff gets a bit technical, but I think Gleick does a good job of presenting it all without making it either too simplistic or too dry. He finishes it all up with a couple of relatively light chapters about the deluge of information we're all now exposed to, thanks to the internet, and how we are or aren't handling it. As he did with chaos theory, decades ago, Gleick now attempts to introduce information theory to a popular audience. The book includes lengthy sections on Babbage and Shannon, surrounded by shorter discussions on other important topics (quantum information theory, information overload, etc.). The book includes an early, slightly off-kilter discussion of the origins of information in early writing systems. Some conclusions here seem questionable. The genealogy of alphabet --> information seemed incomplete and perhaps a little Eurocentric. Some parts seem to overreach. On page 16, for instance, Homer, Virgil, and Aeschylus are cited as sources who recount the use of fire beacons in the Trojan War. The Homeric epics are no guide to 12th century Mediterranean technologies, since they are considered to contain numerous 8th century anachronisms. Certainly, Virgil and Aeschylus are even further removed. If the best source for this information was poetry, several centuries removed, then the example (which was not vital to the chapter) should probably have been left out. One could make too much of this, but a misstep occurring so early in the book made me wary (probably unnecessarily so) of other conclusions and summaries offered by the author. The section on the information deluge was appropriate in its length and coverage; so much has been written about this, elsewhere and recently, that this section could easily have been overdone. I would have appreciated attention to Jaron Lanier, here, but this is a personal preference and not a necessity. Gleick's use of Marshall McLuhan was interesting, in that McLuhan merely popped in frequently, rather than having his own spot in the book. This was disappointing, as McLuhan is an interesting character to include when discussing the social impact of information, new media, etc. But at 426 pages (plus the seemingly exhaustive index and the extensive notes and bibliography), the book probably could not bear any additional close character studies. Subtitle: A History, A Theory, A Flood. James Gleick is one of my favorite popular science authors and he doesn't disappoint in this book either. While the book is quite long, it only tells have of the story. In my view, the uninteresting half. The development of the different information technologies is well told. The familiar cast of Babbage, Lovelace, Shannon, Gödel and Turing are given loving portraits and their ideas well explained. With Richard Dawkins' meme, Gleick reaches the present. What he fails to realize, is that information is subjective. Gleick's objective, physicist's world breaks down in social systems. He brushes upon this in his discussion of contaminated memes but does not continue his journey on to communication theory and sociology. He should have distinguished between data and information. Information has to be both new and relevant to the sender. Otherwise it just creates information (actually data) overload. A general introduction to some of the paradoxical results of information remains to be written. One example: You have to know the information to assess its value. But why would you pay for something that you then already know? This paradox lies at the heart of the media's struggle and inability to make the user pay for information. Completely fascinating, although, at time, over my head. Would love to own! 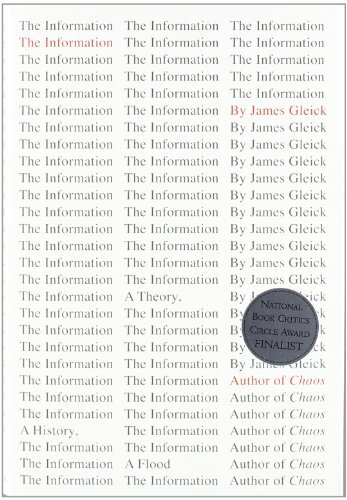 Gleicks's book is a historic overview of the evolution of 'information theory', discussing the very concept of communication, from early alphabets to the proliferation of Wikipedia entries. The main hero of the book is Claude Shannon, the engineer who first applied the concept of 'entropy' to information, and showed how this could be used for cryptography as well as for compression - but the book also shows how Samuel Morse had similar ideas when he invented his famous code, and how even the 'talking drums of Africa'¹ employed the same mechanisms of a small code-set complemented by redundancy. There is also a chapter dedicated to the (at the time) unsung duo of Babbage and Lovelace, where he shows how their work - while impractical at the time - also presaged the same general development. Another important subject is formal systems, and their inevitable incompleteness - Here he echoes Douglas Hofstadters Gödel, Esher, Bach, but also another book that deserves mentioning,Tor Nørretranders Mærk verden, (In English rendered as The User Illusion). The book concludes with a chapter on 'information overdose', the case when too much information actually impedes decision-making. Very interesting, as I was listening to Malcolm Gladwells book Blink in parallel; a book that champions the idea that it's more important to consider the right information rather than all the information in order to make the right decision. I think this book well deserves it's place next to Hofstadters tome. Gripping account by Gleick. His section on Babbage (who married Lord Byron's daughter Ada Lovelace, who also ran the analytic engine) is excellent. The whole book is a veritable tour de force. Destined to become a classic. Well written, engaging, far reaching romp through information theory. Never thought I would see this as a popular science book. Recommended for anyone with so long attention span, as some of those concepts will require an effort to sort through. Worth the effort. This is a book that covers everything you could want to know about “information”. This is a book that goes too far afield in trying to cover everything. This is a book that lays a solid foundation for understanding where we are today. This is a book that spends too much time on histories that are unimportant. Yes there is a lot of information in this book about information. And, sometimes it can feel like too much. But I would rather an author try for more and not quite make it than settle for less and succeed. Gleick gives us everything we could want to know and more. We learn about how information is transmitted by African drums. We learn about the origin and impossibility of dictionaries. We learn about all that Babbage tried to do with his calculating machines and never accomplished because he wanted to do more. We learn about codes and code breakers. We learn about randomness. We learn about how technologies fundamentally change who we are. We are guided from the drums to the molecules of information. The early chapters were boring, but the later ones were great. As I just commented to a friend: "Absolutely loved it. The chapter about Ada Lovelace and Charles Babbage was perhaps among the best chpaters of any book I have ever read. That's the only way I know how to put it -- this book left me wishing it was twice as long." Ambitious, expansive, dense, and frequently quite interesting. Fascinating study of the genesis and development of information as a scientific subject in is own right. A powerfully engaging book, heavy on history and heavy on observation and assessment of historical and current technology of communication. "Technology changes the way we think," is one of my takeaways. From the jacket: "…the story of information technologies that changed the very nature of human consciousness."